Cais do Sodre is a major central train, metro, bus and ferry hub. If you are travelling from Lisbon airport to the central train station of Lisbon you have 3 transportation options: Taxi, Metro and Bus. Taking a Lisbon airport taxi is the most convenient mode of transport. The taxi trip will cost around 25€ and it will take approximately 25 minutes. An alternative less expensive option is the metro. The indirect metro transfer will take around 35 minutes and regular tickets cost only 1.45€. In addition, there is a bus service operating from the airport straight to the train station. The price of a bus ticket is 4€ and the average travel time is 45 minutes. Welcome Pickups offers meet and greet services and a friendly introduction to Lisbon at the same price as a regular taxi. Click here to see the cost. Taxis provide the most convenient and secure way to travel from Lisbon airport to the central train station of Lisbon. The average trip duration from the airport to the central train station is 25 minutes, but that may change, depending on traffic. Most of the official taxis in Lisbon are cream-colored. However, there are still a few old that are black or mint green. Lisbon airport taxis do not have an official flat rate for the transfer from the airport to the central train station. A taximeter will calculate the price of the journey, depending on distance. Moreover, the taxis of Lisbon charge extra for each luggage piece and late-night driving. However, the average price is 25€. Hiring a taxi is the best transferring option when you do not want to waste time at the busy airport of Lisbon in order to catch a train. "MyTaxi" is a mobile app for calling taxis in Lisbon which pre-filters the taxi drivers based on the quality of their services and ensures that your driver will take the fastest route possible. For more than 4 people, there are taxi minivans and station wagons. The driver must choose the shortest route. 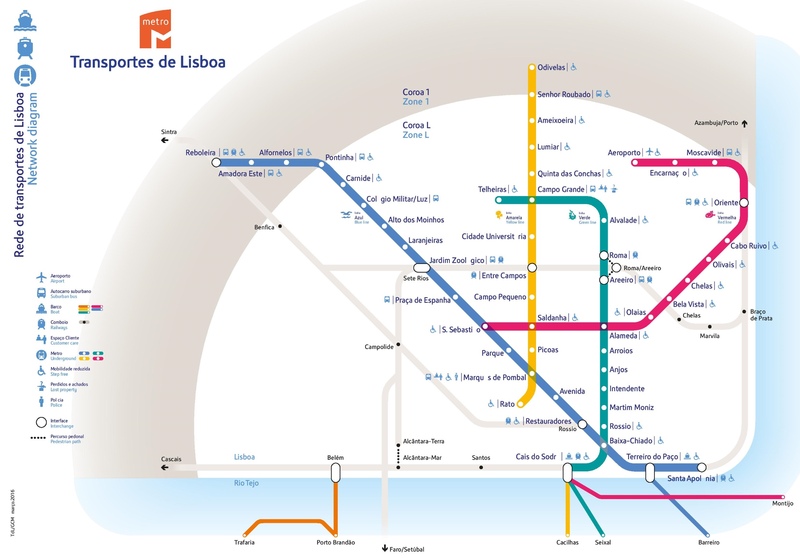 The metro network of Lisbon is connected with Cais do Sodre train station via the green line. However, when travelling from the airport you will first take the red line and switch to the green at Alameda station. The metro trains of Lisbon operate at 6-9 minute intervals and the average travel time towards Cais do Sodre is only 35 minutes. How much is the metro from Lisbon airport to central train station? A regular one-way metro ticket costs only 1.45€. However, the first time you will have to buy a re-loadable Viva Viagem card for 0.50€ which you can use throughout the public transport network of Lisbon during your stay. Metro tickets can be purchased from the ticket counters and automated ticket machines of the airport. Total waiting time for the metro trains is around 20 minutes. The metro trains of Lisbon run from 06:30 a.m to 01:00 a.m. The metro station of the airport is located at the right side of the arrivals hall of terminal 1. If you arrive on terminal 2, you will have to use the free shuttle bus that travels between the two terminals. Most tourists prefer to use the metro for their transfer from the airport to Cais do Sodre railway station. It might be a little inconvenient to switch lines while having many pieces of luggage, but the fare is very cheap. Please be aware of locals offering to assist you with buying your metro tickets. Their help does not come for free since they will demand to be tipped. Do not throw away the metro ticket receipt until the end of your transfer. The queues for the metro ticket machines are usually very long during rush hours. The metro trains tend to get overcrowded and luggage space is also limited. 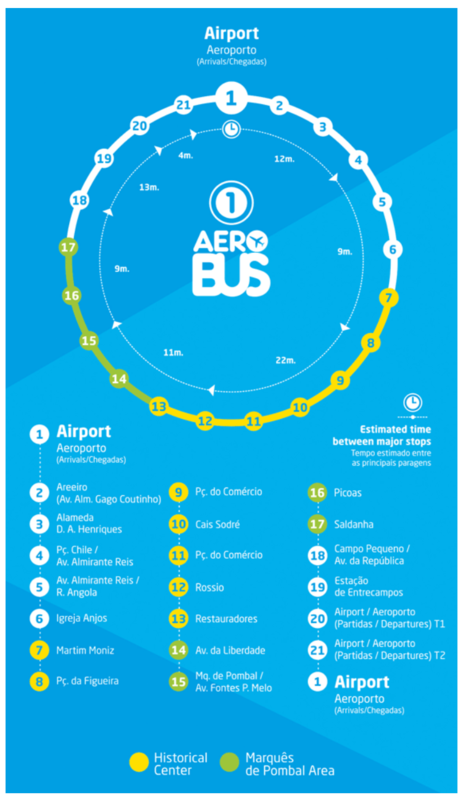 The Aerobus Line 1 operates the route from the airport to Cais do Sodre train station up 3 times per hour. No change is required and the average travel time is 45 minutes. There are other cheaper public buses that serve a similar route, such as the Citybus line 783, but you must have only one piece of hand luggage in order to use them. How much is the bus from Lisbon airport to central train station? Regular one-way tickets for the Aerobus cost 4€ per person and can be purchased from the airport's ticket counters, straight from the driver or online. The lines of the Aerobus service operate from 07:30 a.m to 11:00 p.m. The bus-stops of the Aerobuses are located just outside of the arrivals hall of terminal 1. If you arrive on terminal 2, you will have to use the free shuttle bus that travels between the two terminals. The Aerobus is ideal if you want a cheap, comfortable and quick transfer from the airport to the central train station without having to do any line changes. The Aerobus stop at terminal 2 is only for departures. In fact, all the arrivals are handled only by terminal 1. The Aerobuses are equipped with large luggage racks. Only small pets in boxes and cages are allowed on the bus. There is also the night bus line 208 that travels from the airport to the train station between 11:42 p.m and 04:42 a.m.
How much is a taxi from Lisbon airport to Central Train Station? The average price of a taxi trip from Lisbon airport to central train station is 25€. Without traffic, the ride takes around 20 minutes. How is the Central Train Ttation of Lisbon called? The central train station of Lisbon is officially called Cais do Sodre and you can get there from the airport either by taxi, metro or bus. How far is it from Lisbon airport to Central Train Station? The central train station of Lisbon is approximately 15 km from Lisbon airport and you can get there either by taxi, metro or bus.